This time I was lucky enough to be able to incorporate green and red peppers that were grown in my mom's garden! That was pretty exciting. 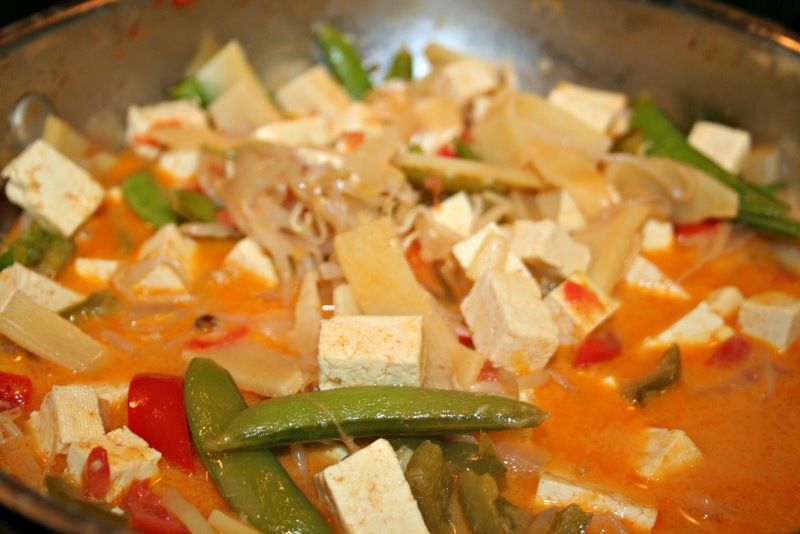 Besides that I followed this recipe and I used snow peas, an onion, extra firm tofu, bamboo shoots, sprouts, coconut milk, red curry paste, salt, Asian fish sauce, garlic, vegetable oil and Boil-in-a-bag brown rice. It wasn't the best curry I've ever made, but it was definitely tasty and super easy to make. Definitely worth it. So in addition to eating far less meat and dairy (which I already rarely eat because I'm lactose intolerant), I am also trying to lower my sugar (and alcohol!) intake and amp up my workouts a lot. You would think after training and completing a half-marathon I'd feel like I was in better shape, but I think all my crazy eating habits lately have gotten in the way. I don't have a certain weight loss goal or anything, but I just need to feel comfortable in my body again. This doesn't feel like me. Generally I am pretty cautious of writing anything that hints at insecurities especially weight-wise, but the point is to be real, right? And even though I don't consider myself "fat" by any means, I feel that it's important to feel comfortable and confident, and to be able to talk about it when I don't feel this way. I recently read a post by a very health-conscious running blogger about this issue and it definitely resonated with me. If you're interested, please check it out here. The point is, everyone has insecurities, and this is my plan to get back to where I'd like to be. So hopefully there will start to be many more posts on here documenting my workouts and healthy cooking conquests. Who knows, perhaps there will even be a full marathon in my future. You will do great. You have the will!! Looks Great! I was thinking of posting cooking blogs too, only problem is I can't make my own recipes! hahaha Maybe I'll review other recipes after I make them!